The Blackhawks started their 2017 Training Camp on Friday at the United Center, but two bodies weren’t on the ice. Veteran defenseman Michal Rozsival did not pass his physical and cannot participate until he does. This isn’t a surprise as it was recently revealed that he’s still struggling with post-concussion issues. Nathan Noel suffered a lower-body injury at the recent Traverse City Prospect Tournament and won’t be able to participate in the camp. Noel, 20, was a fourth round pick (#113) by the Blackhawks at the 2016 NHL Draft. 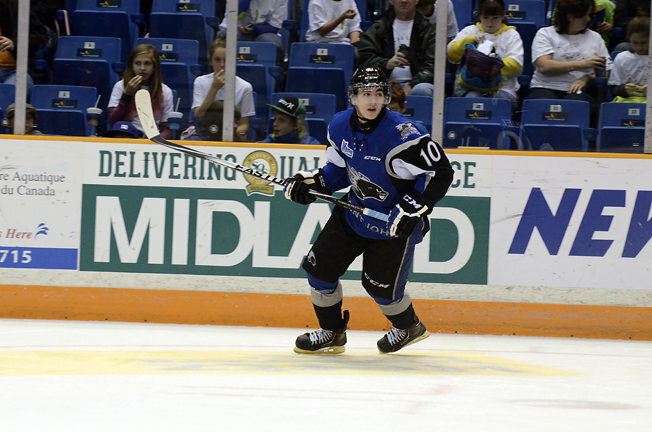 He scored 24 goals with 26 assists in 52 games with Saint John in the QMJHL last season. The Blackhawks signed Noel to a three-year, entry-level contract beginning this season back in April. He was seen in a brace on his right knee at the United Center on Friday. Read- Q said–Hayden had a good “noticeable” day at camp. I could center that line and no one would be surprised if Kane scored two goals. If he can help then kudos to Bowman for signing him and maybe he will help sooner than later too. So no more of this Rozy #7 nonsense. I’ve been saying it for the past month. He’s merely an interpreter for Kempny and Ruuta. The Hawks are glad to pay him him for his days when they won the Stanley Cups. Reports from camp Q saying 20,19,14 & 10,8,88 top 2 lines. Wonder how long that lasts. If the Blackhawks ltir Rozival too along with Hossa and recall replacement salaries they could max out ltir space at 7.5m or ten percent over cap which most you are allowed to use. Not many reports from training camp from the first two days. I’m hungry – feed me. Somebody has news about the kids and the rest of the guys at training camp ???? D-Cat and Hartman looked good too. From Scott Power reports.Hayden and Hino looking good and sticking out apparently Fortin more noticeable this morning they will be getting a look for 3rd line spot with Debrincat and Jurco too, to play alongside AA abd Hartman . Kane and Schmaltz look real good together and Q made comment about Schmaltz centering 2nd line with Kane and Sharp who has looked really good to start year. Debrincat played with Dauphin and Wingels and created some chances. Defense pairings Keith/ Murphy Forsling/Seabrook Kempny/Rutta Gus/Franson. Rutta making a case and Murphy getting comfortable. Wall from what I read Q was impressed with Schmaltz that he seems stronger on the puck and is working in his faceoffs and expects improvement in that area. He said Kampf playing with kane and Schmaltz was to get a look at him and had no visions of Kampf being 2nd line centre. Debrincat playing with Schmaltz and Kane today Q said he liked the 3way chemistry. Schmaltz 2 goals almist a 3rd. Snuggerrud looked good too I guess real nice stretch pass to set up Knott. Watched the hi lites… D cat made a Beautiful feed to 8… it was against Keith in a tight seam…. I cant speak for Snuggy d game… but his offense and ability to move the puck… is great. Toews does not need SAAD!!! In 2015, SAAD RICHARDS and KANE were great! We need to give KANE that rugged winger which translates into better playoffs. Here is were Q needs to put his pants on and not listen to BOWMAN about selling tickets with a 5’6″ DeBRINKAT playing!!! His needs to go to AHL!! We need size!! !Plus VINNY is a much better skater who can also play center!!! And ANISIMOV is a 3rd line centre! With pretty much all of the youngsters not on the roster now being waiver exempt, there’s a good opportunity after Hossa goes on ltir in the first part of the season to give alot them auditions. Might be a much better way to let guys like Debrincat, Fortin, Kampf, Dauphin etc. get their feet wet one at a time and have the veterans there for insurance. Sharp is probably the season starting 2nd line winger for Schmaltz to have 2 veterans and also take the pressure off him taking all faceoffs. It’s a little hard to tell much of anything because it’s only been 3 days of camp with virtually little of no reports or video. A couple beat reporters tweeting this or that guy made a nice play. All of which are Hawk players against Hawks players so who knows if the offensive play was good of just defended poorly. I find it a little too optimistic to buy DeBrincat-Schmaltz-Kane as the 2nd line – mainly because none of those players can play defense well enough to be on a line with two other guys who are weak defensively. Plus they can’t win a faceoff to start with the puck. They would probably score some pretty tic-tac-toe goals but also give up as many or more. Hopefully I’m wrong – but I’ll need to see it to believe it. Speaking of seeing it – the Hawks first preseason game is still a few days away so I’ll wait to make judgments until after I see how they play against another team. Really like the amount of positive comments from the prospect tournament and training camp. This blog is hard to impress. Dave, Denis Savard was not 5’6″ or 5’8″? Please? Let’s not compare the little Cat to hall of famer SAVY! Do your homework on DEBRINKAT size as well… I saw SAVY play with the 3 Denis in junior hockey in Montreal….. I was in Chicago went they retired his jersey….he is not 5’8″…Chill my friend. Hawks need size and speed…. What happened with PANARIN on the wing in the playoffs? DO you recall the lineups when the HAWKS won 3 cups? Be real…. I think Fortin, Iacopelli, Knott need to get a serious look on the wing for the near future! And Dave, draftiing Debrinkat when the HAWKS had Panarin on the roster and KANE made no sense to me in my opinion. Of course, we all have different opinions… Ask the USA junior team that won Gold their opinion?????? Don’t understand the worry over Debrincat. He wìll be like any other rookie he gets a chance and either he lights it up and forces Q to keep playing him or after a period or so he rides the bench until he is sent down again. But in the O zone- they would nearly as good as past w/72… and I think Schmaltz there would make that Line even Better than 72/AA/88 in transition. Totti-I have been a proponent of the Hawks getting bigger but not at the expense of allowing players who have a freakish gift or gifts to contribute–Debrincat has been fighting the ‘too small’ label at every level, and I’m sure that fuels him. Your centering him out is getting really old. Natural goal scorers don’t grow on trees, and goals are at a premium in the NHL today, and smaller players, if they can either really skate or put the puck in the net, are more than welcome. He does the later really well, and I predict that won’t go away. And his passing gets overshadowed. 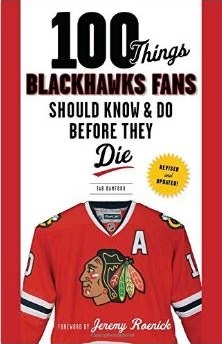 There seems to be two schools of thought regarding why DeBrincat should not make the Hawks team. One school of thought is that due to his lack of size and speed he will never be an NHL player and the other school of thought is that he may play in the NHL someday but he needs to take it one step at a time with the next step being to play against pro players in the AHL. I’m in the second group, but I could be convinced that he should make the team if he does very well in preseason games. The proof is in the pudding – he either wins a spot on merit or he goes to Rockford to try to earn a call up. He has very good offensive skills. Writing him off completely because he’s small doesn’t make sense to me. in a scenario where “a late season 20-25 games” situation is available for Fortin, who do you want/see getting hurt and/or traded Hawks2010? I like the kid’s game, too, but there are only 12 forwards who dress for any game and right now the Hawks have about 16 (not including Tootoo or Bouma) that I’d like to see get 20-25 games. Blackhawks too many young nhl ready forwards and short on nhl ready dmen. Vegas too many nhl ready dmen and short on young nhl ready forwards. Maybe with ltir room. I respect the kids scoring talent but the philosphy trading for SAAD is what the HAWKS should stick to. Maybe DEBRINKAT plays 3rd line next year….or at some point this year….but he does not have the speed of a PANARIN or SHARP or SAAD so why should we downgrade this year. Give him a year in the AHL. Rather see FORTIN, KNOTT and JURCO get a real chance…We had PANARIN who is lights out ahead of DEBRINKAT… MOVE on from this BOWMAN smoke screen and hype. Again, you need talent tyo scorwe that many goals in JUNIOR but the reality is the HAWKS do not need him at this point… I cannot iamgine hij playing on the road against the PREDS or the SHARKS or the OILERS , or the BLUES….Really….Let’s focus on others…. Tab…i dont think Jurco will be on roster by the end of the year ( just a feeling)and Sharp ( i hope he will not get hurt but …) Sharp will probably be out a few time this year with injury ,i would not be surprise to see him missing 20-30 games in the season and probably it will be at the end of the season wen accident usaly appears because so many games played during the season . Bauma is a big ??? Fortin is probably the best option …Fast ,good Hockey sense,two way player, shows up every game .and will learn a lot How to play pro hockey in Rockford with the new coaching staff. 2010 Hayden will likely be recalled when Hossa put on ltir and Forsling for Rozival. Giving Bownan the max ltir room of 7.5m( 10% over cap) and Franson signed will quite possibly happen between opening day and their first game. With 3 or 4 fringe forwards who could be exposed to waivers and not be an issue if claimed there may be lots of opportunity for deserving young players and/or acquisitions when season begins. Getting close to cap limit for opening season is first though.